AUGUSTA, Sicily -- Nawras Soukhta, 15, huddles against the back wall of the steel boat as it motors into port in the small Sicilian town of Augusta. He’s been crumpled there for the last hour saving what little strength he has left as he waits for this stage of his journey to end and the next to begin. And now it’s time. Nawras unfolds his stiff legs and steadies himself against the hard metal rail of the ship as he stands, his yellow shirt and stained whitewashed jeans flapping on his slight frame. Anxious murmurs begin to ripple through the nearly 100 migrants on board as the boat nears the dock. Within seconds, a group of guardsmen waiting on land have jumped aboard and corralled the edgy passengers into a single-file line. At its head is a passenger with surgical screws still poking from the flesh of his twisted leg -- reminders of the savage war he’s left behind in Syria. His face grimaces as he hobbles forward -- yet medical attention is not his first priority as he wills himself up each step and onto the port’s landing. "Where is the fingerprinting?” he whispers, his eyes darting from the water, to land, to the swirl of Italian police, guardsmen, and NGO workers surrounding him. “Will they force registration here?" The other immigrants follow the man off the boat, and soon Nawras finds himself on land -- the first solid ground he has touched in 11 days. But there is no time to waste kneeling down to kiss the earth. While Nawras may no longer risk drowning in the Mediterranean like the 3,400 who died in 2014 while making this crossing, the perils still stretch out before him, and the new life he has paid thousands of dollars and risked everything to reach still waits, more than 1,000 miles to the north. Like over 3 million other Syrians, Nawras fled his country in 2012 as the Syrian civil war ramped up in brutality. Along with his mother and six siblings, he escaped Damascus for Istanbul soon after his 13th birthday, where the family has eked out a living for the past two years. (His father died about a year before the war began.) Between classes at a school for young Syrian refugees, Nawras worked at a small restaurant and with an electrician, earning between 5 and 10 Turkish lira ($2.5 to $5) for 12-hour days. When it came, each lira went to his mother, but Nawras, unable to legally work, had little leverage when his bosses simply refused to pay. Still, after two years he and his family had finally saved up enough money. Nawras is bound for Sweden. "My mother didn't want me to go because it's so dangerous,” Nawras says in slow but proficient English, “and my sisters were very worried but it is really the only choice. We have no life and no future in Istanbul." Nawras’s journey to Sweden represents one of the last options for his family to be together, but it is one he must make alone. Over the last year his three older sisters have all made it there. But Nawras’s journey carries extra significance: Unlike them, he is a minor, so if he makes it and receives asylum, he’ll likely be able to bring his mother and two younger siblings to Sweden as well. Without enough money to send anyone with him, the family’s dreams for this future together depend on his success in evading authorities over the course of the next few days. Current EU law demands that all migrants who arrive to Europe by Italian shores register for asylum in Italy, and make that country their home. But it’s a fate most seek to avoid: Registering for asylum in Italy means entering its labyrinthine bureaucracy, then getting spit out into its still-hobbled economy, and becoming dependent on its overwhelmed social services. Worse for Nawras, if he’s stopped and forced to register, his sisters will be bound to Sweden, unable to bring their mother or younger siblings across, and Nawras will become fastened to Italy. His future with his family will all but dry up. “I just want to study and be with my family," he says. "I promised my father before he died that I would become a doctor. I think a new life is possible in Sweden." And so he works his way north, constantly looking over his shoulder as he goes. Sweden is often near the top of the list for asylum seekers looking to rebuild their lives -- especially Syrians. 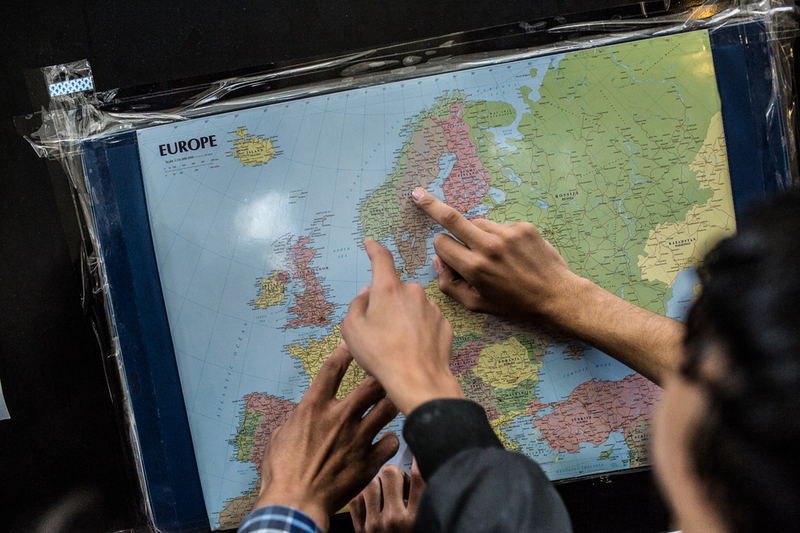 With medical and dental care, daily allowances, assistance with accommodation, and English, Swedish, and IT classes, the country offers relatively high institutional support to help migrants integrate. Equally important for Nawras is the fact that in September 2013 the country began giving permanent residency to all Syrian refugees who manage to reach its borders -- a status that translates into full Swedish citizenship after four years. The number of new asylum seekers has since skyrocketed. According to Magnus Bengtsson, the department head for the Swedish Migration Board in Malmö -- the southern city Nawras hopes to reach -- the yearly estimate of new asylum seekers for the country was set at 54,000 at the beginning of 2014, yet by the end of the year it had received a total of 81,301 applications for asylum, or roughly 223 refugees every day or nine every hour. Over 7,000 of those were unaccompanied minors like Nawras -- a figure that’s more than double the total number of refugees who applied for asylum in all of Finland between January 2014 and the beginning of December. But to get to this northern promised land, migrants like Nawras who arrive in Europe’s south must navigate a balance: playing along with authorities’ efforts at oversight, while trying to skirt out from under that supervision as soon as possible. After being quickly assessed beside the water for medical emergencies by the Italian Red Cross, Nawras and the others -- a mix of other Syrians, Palestinians, Eritreans, Sudanese, Somalis, and a few Pakistanis -- are lined back up. Armed Italian anti-terrorism police surround them and shuttle them off to a makeshift holding pen in a parking lot 600 hundred meters away. Two police cruisers prowl alongside and behind the group as they walk. The holding area is not much bigger than a soccer pitch and hemmed in on all sides by metal fencing. The migrants are watched vigilantly by police as they move from line to line, giving their name here, place of origin there, picking up a new T-shirt at one stand, then a pair of sandals from another. After a few hours the dozens of passengers are transferred to a nearby transit camp half an hour away. The camp is meant to be the new temporary home for the migrants as they wait out the next three days before registering for asylum -- the moment nearly all of them are seeking to avoid. After seeing the recent arrivals off to this new way station, the song and dance of supervision is over and the police all but disappear. The camp, which houses an assortment of close to 100 migrants who are all antsy to disappear, is left in the hands of a single guard. The bulk of them will flee within 48 hours. Late that night, Nawras and a couple dozen other Syrians escape the camp. Following a few others, Nawras simply walks out the front gate and into the darkness. The guard doesn't ask where he’s going, and Nawras doesn't say. After sleeping in a local mosque for a few hours he is sitting in Catania's train station early the next day waiting for the 8:45 a.m. train to Naples. From there, he hopes to catch a train that will take him to Milan by the following morning. By the end of his trip Nawras will have spent upwards of $4,000 and been on the road for almost three weeks. Eleven of those days were spent at sea, vomiting up the stale rice and rancid fish given to him by the smugglers as they sailed from Southeast Turkey to the Egyptian and Libyan coasts, meeting small transport ships off each country to pick up fresh batches of migrants headed north. "They told us in Turkey the boat was direct to Italy. They told us we would be there in some small days,” Nawras sighs. “But once you are at sea what can you do? You hold on and hope you do not die." As the train skirts north along the coast, Nawras and a group of 16 other men doze in and out of a restless sleep, catching up on the past week and a half they have lain awake at night, tucked against each other on the wooden slats of the boat’s open deck, shivering from the ocean’s constant spray and cold night air. In the hours they are awake, Nawras and the others meet in the privacy of each other’s cabins and share what few cookies and biscuits they have. Nawras is rail-thin, and many of the men push their biscuits on him, urging him to eat more. As they eat the men talk of their hopes for the future, but the conversation always bends back to family left to wait behind. Nawras’s sisters were unusual in that they were women who made this journey themselves; more often it is the men who make the trip, hoping to bring the women and children later. “You cannot find any words to describe the sensations of loss we have,” says Haleem as he stares at the Italian countryside rushing past his window. In his mid-30s, Haleem says he had a good and happy life before the war. A trained pharmacist, he ran his own pharmacy in Homs, his hometown. But as the war ground into its fourth year, his shop had already been destroyed twice and the food and money were quickly drying up. Haleem knew his window for making the trip was closing and, after selling his car, he finally escaped Syria a little over a month before setting out for Italy. His destination is Denmark. If he avoids the police and makes it the odds are good that he’ll eventually be able to bring his wife and two young boys over. Like many of the men packed away in their cabins, Haleem represents his family’s last chance for a future. It is not a weight any carry lightly. “All I care about is my family,” he says. “When we live it is because of family. My family is everything but if I don’t get to Denmark we may not be together and life will be nothing." After 19 hours, the train pulls into Milan’s Porta Garibaldi station at dawn the next day and Nawras strikes out into the dark, gray city in search of Milano Centrale, the city’s main train terminal. Centrally located on Italy’s northern border with the rest of Europe, the city of Milan is one of the country’s most vital transportation hubs and has become the main staging area for refugees flowing north out of Italy. The city’s main train station -- Milano Centrale -- has quickly become the chief waypoint in this stream. There, refugees have been able to meet to discuss possible routes onwards, coordinate with smugglers, and receive wire transfers from family. As the savagery of Syria’s war intensified, the flow of migrants quickly became so high that Milan’s municipality launched Emergenza Siria in October 2013. In coordination with volunteers and NGOs, it now provides food and medical assistance within the train station, and safe haven in nearby shelters where migrants can stay as they plan logistics for their next stage. Since launching Emergenza Siria, the municipality has registered 55,226 transiting refugees -- 39,109 of whom have been Syrian. During peak months they've received upwards of 1,000 people in a single day, the max being 1,600 one day this past September. This decision to provide services for transiting migrants who should, in theory, register for asylum is indicative of larger dynamics playing out across Italy and throughout Europe. Over the course of 2014 more than 160,000 migrants arrived on Italy’s shores (more when considering the number of undetected arrivals). According to Frontex, the European border agency, the number of migrants arriving to Italy in the first four months of 2014 was 823 percent higher than that in the same period in 2013. Even though EU laws require that Italy, like other border states, register these masses of new arrivals for asylum, the country isn’t exactly vigilant about enforcing the laws. There are too many people; the country simply can’t cope. New arrivals registering for asylum in Italy now often wait a year or more for a decision, during which time they're stuck in temporary government-run camps that resemble minimum-security prisons; those who do ultimately receive asylum are sent to a country that provides little support to help them begin a new life. Most struggle to find work and housing, and many end up on the street, where depression and drug abuse are not far off. "My life is nothing here," says Fams, a young man from Gambia who sailed from Libya at the start of the Libyan revolution and now lives in Rome. "I gave my hand (fingerprints) to Italy, so now it looks like I am Italian. I have nowhere to go.” Following protocol, Fams was forced from his temporary government-provided housing once he received his asylum documents -- thus theoretically becoming eligible to rent an apartment. But with no money, no job, no home, and no ability to speak Italian, he wandered the streets for seven months, sleeping where he could and eating what he and a few other homeless migrants were able to collect in a day. Now, after more than four years, he lives with a few hundred other migrants who have occupied an abandoned office building. The building, known as an ocupazione, is run like a cooperative by its residents but is unauthorized by the government, and the occupants are constantly at risk of being evicted. Although he’s learned the language, Fams is still unable to find any reliable source of income and spends his days in a state of limbo. "A man has nothing without work and purpose," says Fams. "I have worked since I was a boy and now I have nothing and no purpose." Migrants, increasingly aware of this grim reality, typically opt to continue north and escape Italy, if they have enough money to do so. According to Progetto Arca -- one of the Italian NGOs providing housing and food for transiting migrants -- of the more than 55,000 migrants who have come through Milan since October 2013, only 140 have asked for asylum in Italy. After registering for a bed with the municipality, Nawras waits the afternoon out in the cavernous lobby of Milano Centrale and watches as dozens of refugees who traveled on other trains and buses begin to trickle in. By 5:30 p.m. a volunteer with the municipality lines him and more than 100 other migrants up in the station’s main hall, each one looking around to try to understand who’s in charge and who can be trusted. “I don’t know where they’re taking us,” Nawras says anxiously, his hands burrowed deep in the pockets of his fake leather jacket, elbows pressed against his sides. He’s been alone for almost two weeks now. In that time he’s traversed thousands of miles, surreptitiously moving from point to point along an underground route that’s required him to constantly entrust his life to hearsay and ruthless men with little stake in whether he lives or dies. A stout Italian man with white hair appears at the front of the waiting group and yells for everyone to follow. The group walks out the massive stone entrance of the train station to a series of unmarked vans idling nearby. “These take us to the camp?” Nawras asks. Some men in the group nod, while others only offer a worried shrug. Two dark-haired Italian women wearing svelte black uniforms stand smoking cigarettes near the station entrance and laugh about something funny nearby. Before Nawras can get a solid answer, the doors to the vans open and the group heaves forward, carrying him with it. As he steps up to a van he raises his head, takes one last look around, and then he is inside. "It was crazy how many [people] we had," says Silvia Panzarin, a staff member at Progetto Arca, which runs and provides care at Aldini. "We were able to care for everyone but we had to open a gym behind the building to house them all." Since October 2013, Progetto Arca alone has housed more than 20,000 transiting Syrians and provided over 600,000 meals. The days spent at these camps are essential for Nawras. Like most others, he needs time for his family to gather and wire money and to coordinate with smugglers. As there are no official channels for migration (a repeated request by humanitarian groups), smugglers are an indispensable component of a migrant’s journey and are present from before a migrant touches the first rickety boat to well after they cross their last border. Smuggling has become an intensely lucrative business -- generating upwards of $6.75 billion dollars a year just for the main routes from South to North America and from Africa to Europe -- and is completely unregulated. Thousands of people have died at the hands of smugglers, who have increasingly taken to treating passengers as cargo, at times even murdering them. The call from the "facilitator" comes in the dead of night: 3:30 a.m. on a Wednesday. Nawras’s flight to Stockholm will be the coming afternoon, the man on the line says -- just a few hours away. Nawras can't sleep much after that and is soon in a taxi headed to Milan’s Linate Airport with a few other Syrians traveling that day. Because he has a genuine passport, he is told he’ll be able to make it past security but he has still arranged his flight and documents through a "facilitator,” who has taken advantage of the opportunity: Nawras pays 550 euros to get booked on the plane -- 400 euros more than the cost of the ticket. By 11:00 he is lined up for the airport security check, one of the final hurdles on the way to Sweden. As he moves slowly through the line he recognizes a few dozen other Syrians and Palestinians from his journey, yet nobody speaks. His hands are clenched tightly around his ticket and passport. His eyes scan the airport’s mix of people and officials, but he tries not to look around too much. “Keep your head low, don’t draw attention, and don’t speak with anyone,” other Syrians have urged him before. Like many of the other migrants inching their way forward, he has no checked bag and no carry-on. A passport, ticket, cell phone, and 120 euros are all he carries. Once on the other side of security he takes a few seconds to catch his breath and then moves quickly toward gate A21, where flight 692 will depart to Stockholm. The terminal is small and within minutes he is close to the gate. As he rounds the last of the duty-free shops he begins to relax. He’s almost there -- and then two police officers quickly step in front of his path. "Where are your parents?” the shorter of the two policemen promptly ask in English. Nawras clenches his ticket and passport tighter now as he tries to remember to breathe. His small frame is tensed; his eyes shoot from left to right and back again. “Are your mother and father with you?” The taller one now asks. “Where are your parents?” the short one repeats. “They are…. They are not here," Nawras fumbles, his eyes cast down at the cold, tiled floor. "My father is dead. My mother is in Turkey." They ask him where he's from, where he's going, and to see his passport. “To … Sweden. I’m going to Sweden," Nawras finally says as he hands over his passport. The two men look Nawras over again as the three stand in the middle of the walkway. Passengers in a hurry walk past; others mull over what type of wine to buy in the duty-free shop behind. Nawras stares at the men’s chests, his neck taut, shoulders pulled inward. The officers rattle off a few quick words to each other in Italian and inspect his passport again. "Sweden is good for you,” the taller policeman finally says as he hands the passport back to Nawras. "Good luck." With that, one officer moves left, the other right, and the two walk past him and continue on their way. Stunned from all that has just not happened, Nawras stands for a few moments in the middle of the walkway. His passport is held limply in his right hand, his ticket is clasped tightly in his left. There is a display selling giant bricks of Toblerone to his right and gate A21 is just a few dozen meters ahead. He lands in Stockholm four hours later.